In light of the upcoming Historic Homes for the Holidays tour on December 8th and 9th, this post will highlight one of Boulder’s best and brightest neighborhoods- Mapleton Hill. Beyond their headlining role in Historic Boulder’s upcoming tour, this area has a lot to offer renters and owners alike. The Mapleton Hill area is located between Alpine and Pearl to the north and south, Broadway to the east, and 4th Street to the west. 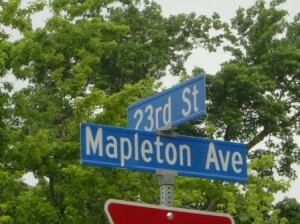 The historical district of Mapleton Hill was established in 1882 and christened with the name thanks to the 200 cottonwood and silver maple trees planted throughout the 1800s to attract residents to the neighborhood. According to WalkScore.com, the area scores an 83, making it the 3rd highest ranked neighborhood for walkability in the Boulder area. A score this high means that most errands can be easily completed on foot. This pedestrian-friendly area offers grocery shopping, nightlife, boutiques, cultural events, as well as enough open space to enjoy a picnic or toss a Frisbee with your dog. Mapleton Hill’s residential architecture gives it its sparkle and charm. Beyond the Victorian homes aged with beauty, you can also find townhomes in San Francisco style, Colonial revival styles and much more- many of these backed by a strong sense of eco-consciousness among the residents. The 2,730 member community is a diverse blend of long-term residents, new homeowners and renters, and young families -largely attracted by the acclaimed International Baccalaureate Program at Whittier Elementary. Thanks to its proximity to the Pearl Street Mall amenities and accessible open spaces, it is labeled as Boulder’s most prestigious neighborhood. All in all, this relaxed neighborhood pulsates with life and is truly the heart of Boulder. In fact, Housing Helpers currently has a great rental property in this area. We at Housing Helpers encourage you to go out and explore this neighborhood and let us know what your favorite spots are! Visit Housing Helper for the best selection of Boulder homes for rent and Boulder rentals. This entry was posted in Boulder and tagged Boulder, Boulder Homes, Boulder Real Estate, Boulder Relocation, Boulder Rentals, Downtown Boulder, Historic Homes, Home For Sale Boulder, homes for rent in boulder, Mapleton District, Mapleton Hill, Mapleton Hill Homes Boulder CO, Pearl Street Mall on December 4, 2012 by John Iannone.